In concept, the transfer molding process is a simplified version of injection molding. It provides many of the benefits of both injection and compression press molding. Transfer molding presses allows the molding of intricate parts while providing highly accurate dimensional control for low to medium production volume requirements. The cycle times are generally longer than injection molding, however they can be very cost competitive. 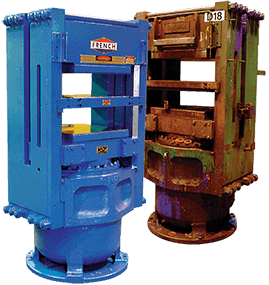 A transfer molding press can also reduce cure time by heating the material before it reaches the mold. The material can be and is forced into a closed mold by means of a hydraulically operated plunger, or by using the compressive force of the press in combination with a tooling with an internal transfer pot. 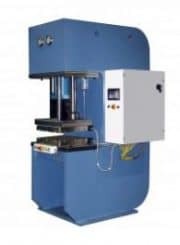 The transfer molding press was developed to facilitate the molding of intricate products with small deep holes or numerous metal inserts. It is ideal for insert molding because the tool is closed prior to the material being transfer, which limits the amount of shift with the insert parts. Contact French engineers with any questions about our Transfer Molding Presses. Read about our 250 ton Automatic Hydraulic Vacuum Press custom designed for cold pot transfer molding. For multi-cavity tools, labor cost is lower than compression since only a single pre-form is necessary. Resin Transfer Molding (RTM) is a low pressure (typically under 100 psi), closed molding process, which offers a dimensionally accurate, and high quality surface finish composite molding, using liquid thermoset polymers reinforced with various forms of fiber reinforcements.